Next time you’re looking for a weekend getaway, look to the Pacific Northwest and the great state of Oregon. It’s just a quick plane ride from California, Washington, and other Western states. Once you land, you may be tempted to explore the big city life in Portland. Feel free to get some donuts from Voodoo Doughnuts, and make sure to stop by Powell’s City of Books, a bibliophile’s paradise that takes up an entire city block near downtown. But don’t stop there, because there’s a lot more to The Beaver State than just Portland. Residents of the Pacific Northwest are known for their love of the outdoors. That part of the country is beautiful to look at, but it’s also a great place to exploring. Hiking, biking, and mountain climbing are all popular endeavors for residents of Oregon. Another big hobby is fishing. 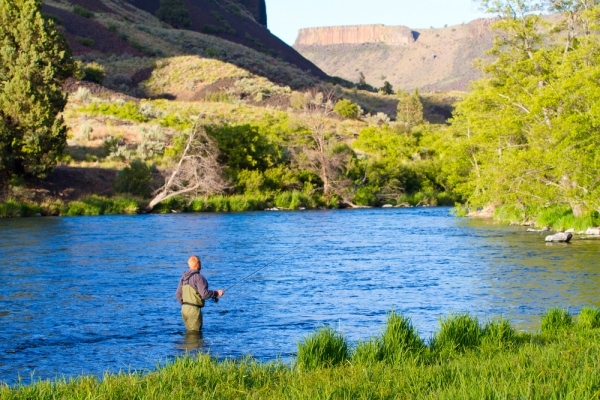 Whether you’re looking to snag Rainbow Trout, Steelhead Trout, or something else, Oregon lakes and waterways have got you covered. In most cases, you’ll need to obtain a state fishing license first. There’s no use bringing your equipment out to the lake and catching a big haul if it’s going to be confiscated by park rangers. However, if you join an organization like the Oregon Fishing Club, you’ll gain exclusive access to over 20 private lakes and ponds in and around Portland, no fishing license required. The OFC also offers access to more than a dozen private campsites. Conservation of the earth’s natural resources is big in places like Oregon. Whether you’re at a private pond or a public lake, make sure to follow all the applicable rules and regulations. Clean up after yourself. Don’t litter. Don’t act like you own the land, because you don’t. The planet has limited resources, and we all have to share. If the outdoor life isn’t your thing, then rest easy: There’s plenty of fun to be had indoors as well. You may not think of “casino gambling” when you think of Oregon, but you really should. Places like The Mill Casino in North Bend offer slots, table games, and more for those 21 and over. The casino is open 24 hours a day, 7 days a week. There’s also an attached hotel where you can kick back and relax once you’re done gaming for the day. Don’t want to leave Fido at home? Bring him and reserve a pet-friendly room for an additional fee. If you’re looking for a romantic anniversary weekend with your sweetheart, consider reserving a Jacuzzi suite. The casino hasn’t forgotten the RV fans either, as there’s an entire RV park with both back-in and pull-through sites. All the sites offer water, sewer, and electric hook-ups. Cable TV and wireless Internet connections are also available. So it’s time to make a decision. Do you prefer taking your chances with fish or slot machines? Would you rather relax at a rustic campsite or inside a luxurious suite with a hot tub? Whatever your prefer, you’ll find it all in Oregon.